Edward D. Mullins has been a member of the New York City Police Department since January 1982. On July 1, 2002, he was elected President of the Sergeants Benevolent Association by an overwhelming majority of its members. Early in his career he was assigned to the 13th Precinct on Manhattan’s East Side. After nearly 10 years he was promoted to Detective and assigned to the 10th Precinct in Manhattan’s Chelsea area. Promoted to Sergeant in 1993, he was assigned to the 19th Precinct on Manhattan’s Upper East Side and subsequently transferred to the Detective Bureau in Brooklyn South, where he served in the 67th Precinct Detective Squad, Special Victims Squad, and the Kings County District Attorney’s Office. Mullins learned about labor management as a PBA and SBA delegate in the 13th and 19th Precincts and the Detective Bureau. Mullins is one of four children raised in Manhattan’s Greenwich Village. His father was a longshoreman on the West Side docks, and his mother, Carmen Lopez-Mullins, was a homemaker. He and his twin sons reside in Nassau County. A lifelong believer in the merits of education, Mullins received a bachelor’s degree from Concordia College, where he completed his studies while working as a full-time police sergeant, and a master’s degree in organizational leadership from Mercy College. 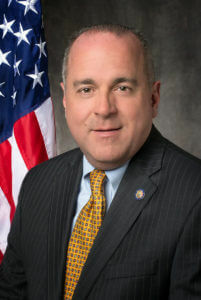 Additionally, he served as founder and Chief Executive Officer of a successful private security firm in Manhattan, and has attended a variety of educational workshops in security management, finance and labor studies, including those at John Jay College of Criminal Justice, New York University, Cornell University, and Harvard University. As President of the SBA, one of New York City’s most visible labor unions, and one of the largest police unions in the nation, his responsibilities are significant. Besides overseeing the daily administrative and operational functions of a 11,000 member organization with assets in excess of $180 million, he is the organization’s chief spokesman, advocate and visionary. He serves as Chairman and Trustee to the union’s Health Benefits Fund and Annuity Fund. He is a Trustee for the New York City Police Pension Fund, with fiscal holdings estimated to be in excess of $16 billion. Additional duties include initiating legislative and political action agendas on local, state, and national government levels. Mullins is an adjunct lecturer at Mercy College. He is a Knight of the Equestrian Order of the Holy Sepulchre and the recipient of the 2005 Ellis Island Award the Dr. Martin Luther King Award from District Council 37, Local 1457. He has been named Man of the Year by the Deborah Hospital Foundation, the Bronx, Brooklyn and Queens Conservative Committee, the Emerald Isle Immigration Center and was appointed for a second term by the United States Secretary of Labor to the Advisory Committee on Apprenticeships. He was a National Co-Chairman for First Responders on Senator John McCain’s Leadership Team and was the Principal Speaker at the Cathedral Club of Brooklyn. He is a member of the Board of Directors for Building Bridges of Long Island, Mercy College School of Business and the National Football League Players Alumni Association where he serves as Treasurer; he has served as a volunteer firefighter in Nassau County, head coach of the men’s ice hockey team at New York University and is a member of the American College Hockey Coaches Association, the Amateur Hockey Coaches Association, USA Hockey and the National Association of Fitness Professionals. In addition to coaching at the collegiate level he continues to dedicate countless hours to youth hockey in the Long Island Amateur Hockey League in New York. In the short time he has been President of the SBA, Mullins has done much to modernize the organization and update its business practices and expectations so that it is empowered to more effectively represent the interests of NYPD sergeants. These innovations reflect his aspiration to serve as an agent of change, while maintaining the integrity and activism that have long come to characterize the New York City police sergeant. © Copyright 2019 | Federal Law Enforcement Officers Association Foundation (fleoafoundation.org) | All rights reserved.